Happy St. Patrick's Day! ! My Irish Soda Breadwas written up a few months ago...click on the link for the details. This meal is really when I get into it...made six loaves this year, and they ALL went !! Whip the cream until it begins to form soft peaks. Add the sugar and whiskey and beat until stiff peaks form. Cover and chill until needed. I've made enough cakes - coffee and otherwise - to know the basics, and I had a pretty good idea of where I wanted to end up with this one...light and moist, with a hit of fruit and that magic crumbly sweetness you find in the best coffee cakes. The sour cream needed an egg and a little butter, for lift and flavor..the flour needed baking powder as well as baking soda to counteract the slight acidity of the sour cream...the fruit needed to stay sweet and suspended in the batter, without turning the cake pink (which can happens with frozen berries), and the almonds needed some friends to help them get a little streusel-y. 40 minutes of baking later, and we were practically fighting each other off with forks to get more. I have a feeling this cake would adapt well to any sort of fruit and nut combination...blueberries and pecans, apples and walnuts, peaches and hazelnuts... always use what appeals to you (or, you know, whatever you have around is always good too :) ). The particular technique I used here actually works best with frozen fruit, since I sort of poked it down into the rather stiff batter...similar to how the Strawberry Buttermilk Cake comes together. You can of course use fresh fruit if you have it - you just may need to make some little holes for it to land in, if the fruit is soft. Trust me, it will all work out in the end....and so, in the immortal words of the Chairman : Allez cuisine !! Preheat oven to 350. Butter and flour a 9" round or square baking pan (I used a fairly deep cake pan). Whisk together the sour cream, melted butter, vanilla and egg until smooth. Stir in the flour, 1/2 cup of sugar, baking powder, baking soda and salt until smooth (this will be a fairly stiff batter). Spread in prepared pan. In the same bowl you mixed the cake in (so you pick up the last bits of the flour), toss the raspberries and 1 tablespoon sugar together. 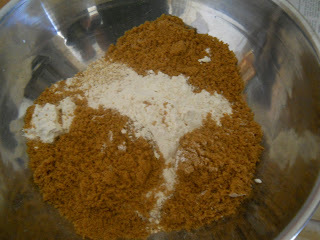 Dump this mixture on top of the cake batter, spreading across more or less evenly. Press the raspberries down into the batter. With a fork or your fingers, work the topping ingredients together until combined and crumbly. Sprinkle the crumbs over the top of the cake. Bake for 40 - 45 minutes, or until browned and a tester comes out clean. Dust top of cake with powdered sugar. Let cool about 10 minutes before cutting and serving.